Matera, Unesco World Heritage site in Basilicata. Click on image for larger view. Jody is still in Europe, hobnobbing with her fellow wizards, while I’m back home, working on my fourth espresso of the morning since my circadian clock stubbornly refuses to acknowledge that I’m no longer in the Mezzogiorno, the land that W. H. Auden aptly dubbed the sunburnt otherwhere. I thought I’d post a few pictures of our trip (Wait! Come back!) and offer a few observations about Puglia, food and biking. The photos appear with a higher than usual resolution, so if you click on them you’ll be taken to a much larger version, which you can magnify even more, a helpful option if you want to see the panorama of Matera above, for example. These are olive trees. One-thousand y. o. olive trees, and still producing olives! Having travelled in France and Italy I’ve seen my share of ancient trees, but never with trunks rivaling junior sequoias. 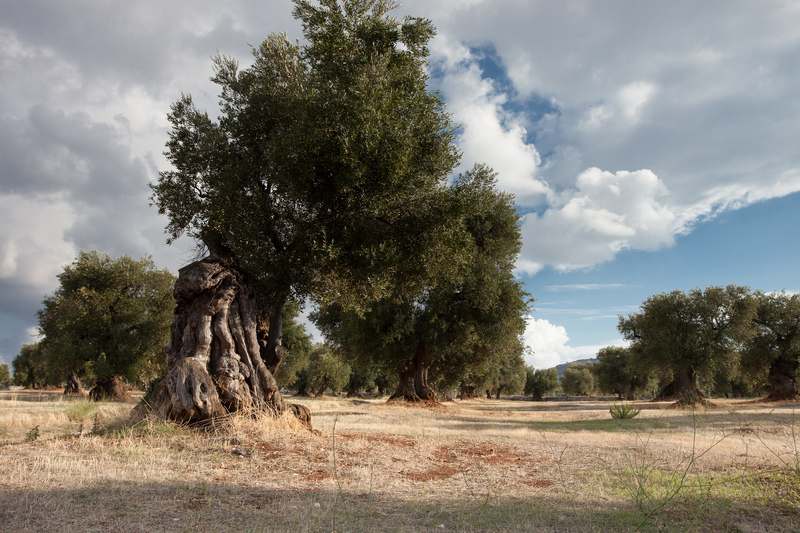 As you might imagine, such trees are considered treasures, and not just by Puglians. The regional government prudently now requires the tagging of any tree over 100 years old to prevent their removal or destruction. With an open landscape of olive trees and relatively flat terrain Puglia is a cyclist’s paradise. The approaches to hill towns can challenge asthmatic wheezers like me, but not my wife. Traffic on rural roads is light to nonexistent and there is often a sense of emptiness about the countryside. Where are the people? It comes as no surprise to discover that much of the area was abandoned in the 1920s as laborers trapped in a sharecropper system of farming emigrated in search of better prospects. Standing on the side of the road, it can be hard to find visual telltales suggesting you’re not seeing things as they were 100 or even 200 years ago. The emptiness, a crumbling wall, a neolithic dolmen, or a pre-Roman olive mill all point to the past, and Puglia has a lot of past. Jody and local chef Rocco Cartia breaking down a goat from the market during one the three classes she gave over the course of a week. 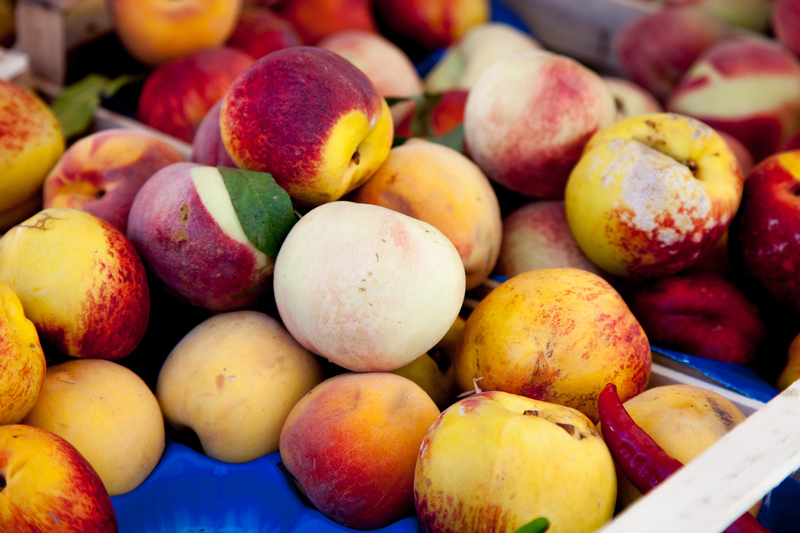 After only a week I can’t claim to be an expert on Puglian cuisine, but I saw a lot of stunning primary ingredients–fruit, vegetables and seafood–often reworked in simple, resourceful ways. (Biggest regret: I didn’t get to taste the purple fava beans I saw at a market.) At an elaborate meal in which it seemed the restaurant owner was determined to make sure we let no traditional Puglian specialty go unsampled we had a wide tubular pasta lightly dressed with a simple tomato sauce presented atop a fava puree. A second pasta course followed–wagon wheels in a different tomato-eggplant sauce atop a puree of yellow pepper. Both were delicious. Local food never seems to stray far from its origins, whether it’s fava been puree, grilled octopus, or raw sea urchins. Fresh mozzarella is almost as ubiquitous as olives, and we ate both at every meal, except breakfast. Yesterday, after making a salad for lunch, I was seized with a feeling of uneasiness. Some internal alarm was pinging. Then I got it: where’s the fresh mozzarella? Seafood is equally striking. After a tour of a wholesale seafood purveyor a couple of workers eating a plate of raw mussels invited me to join them. Their mistake. I ate one, rapidly followed by two more. Blindfolded, I would have mistaken them for oysters, so sharp and briny were they. At the same establishment I saw at least a half-dozen unfamiliar shrimp/prawn/lobster-like creatures–including some giant shrimp with scarlet heads and orange bodies that we incorporated into our antipasti array one night. Did I mention the octopus? The sea urchins? By the way, English-speaking peoples of the world have sea urchins; Italians have sea porcupines. One of the charming things about travelling up the Puglian coast are casual ristoranti tipici advertising their specialties – octopus and sea urchins – the way seaside New England restaurants flag fried clams. Okay, Ken, so what was the wildest thing you ate? The wildest was also the most ordinary–a bowl of handmade cavatelli, their cowry-like shapes glistening with a tomato sauce flavored with… horse meat. A cast-iron pot of meatballs and brasciole fashioned from the meat that had flavored the sauce accompanied the dish. The owner of the restaurant, like many of the Puglians we met, positively beamed with delight at my order, at someone willing to step into his world, and insisted in grating the local cacciocotta ricotta (I have no idea if that’s spelled correctly) on my pasta. His pleasure of sharing something special still gleamed, untarnished by decades of visitors traipsing through his back yard. Note: Take a moment to give yourself an esthetic treat and read Auden’s bitterweet poem Goodbye to the Mezzogiorno in its entirety at Chris Horner’s website. You can see photos of our trip, including shots of a subterranean olive press, cooking classes, food we prepared, and places we visited, here. This entry was posted in Uncategorized and tagged biking, cycling, Italy, Puglia, travel. Bookmark the permalink. Beautiful photos, Ken. I can’t wait for a recipe or two. I am deeply jealous of your summer…. Delightful commentary, Ken, surpassed only by beautiful photos….nostalgic already…. Your pictures are beautiful. Now Puglia is on my list of places I’d love to see. Just Cacioricotta…but I like your version. So earlier this week I was pretty sure I needed to go back to Emilia Romagna ASAP. Maybe I really need to go to Puglia ASAP. I confess that last week I was a bit worried when you said you would be in Europe and might not be posting this week. How would I start my Friday without the Garum Factory? In short, where’s the fresh mozzarella? I was so pleased to find this interesting installment in my in-box this morning (and a bit chagrined that I have not updated my own blog for a week or so and don’t have a trip to Europe to use as an excuse). I can’t wait for the recipes. Welcome home. Glad you had a wonderful, tasty experience. Oh how I wish I could have been at those cooking classes! Stunning photos (especially the panorama). I’m curious about the conical rooftops. What’s the purpose of the cone? Now that looks like a fantastic holiday. I love the fact that you did biking and cooking/eating. A great combo as you don’t feel so bad pigging out as you’ve done some serious exercise. 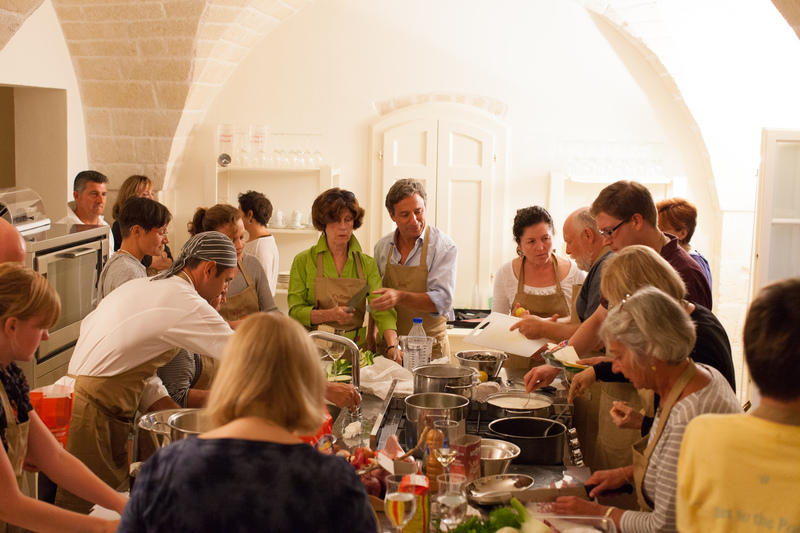 The course looks wonderful – I love the communal food preparation and eating – all looks very jovial. In fact all your photos have been making me feel very hungry. 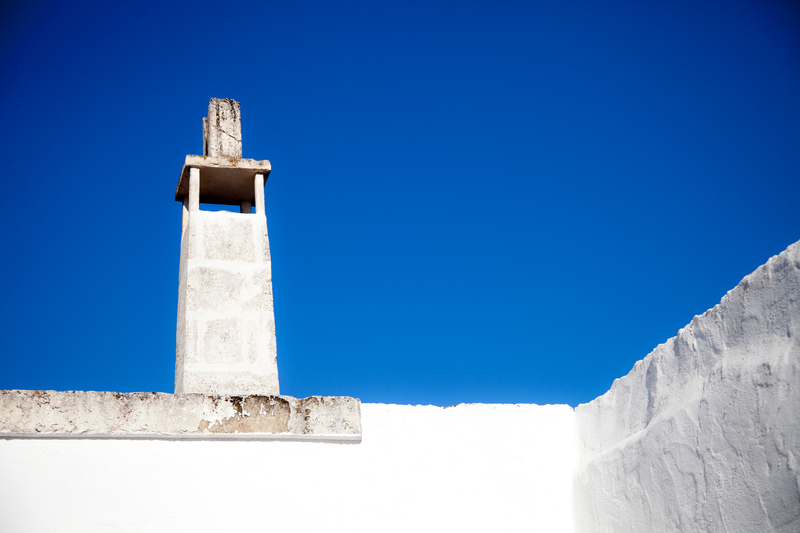 Puglia is a wonderful place – don’t you just love the trulli houses – and as you said far less touristy than other parts of Italy. Did you go to Lecce – ‘the Florence of the south’? Looking forward to you sharing some of the regions recipes. Yes I totally agree. I wonder if they realise how lucky they are? What was the name of the cooking course that Jody taught at? Looked great fun. I did love eating in Puglia especially in Ostuni. The food at our masseria near Fasano was good, too. We did not have so much luck in Lecce as we arrived right before 1 pm when everyone closed shops and went home for lunch and there was nothing available for us to eat. There was one cafe open that served paninis and that’s where we ended up! We did not go in the direction of Matera but stayed on the coast. We did go to Alberobello which was really cute. I cannot remember if we ate there; I don’t think so. I like taralli. There is a nice Puglian restaurant in Shibuya (my office neighborhood) that gives you a bag of homemade taralli to take home after dinner.